RANGERS will travel to Kilmarnock in round five of the the William Hill Scottish Cup next Saturday evening after seeing-off Cowdenbeath at Central Park tonight. First half goals from Andy Halliday, Lassana Coulibaly and Kyle Lafferty had seemingly sealed the tie, but the Blue Brazil hit back early in the second period through David Cox. 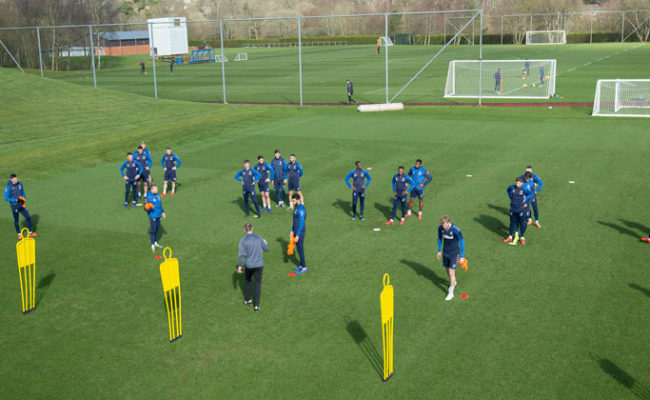 From the team which so impressively defeated Livingston on Sunday, only Nikola Katic, Ryan Jack and Daniel Candeias retained their places as part of eight changes to the XI. Wes Foderingham was handed a start in goals with Jon Flanagan, Gareth McAuley, Katic and Andy Halliday in front of him. 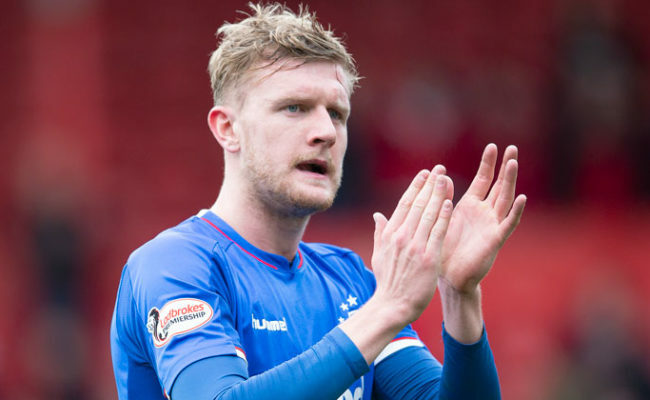 Steven Davis was in too in midfield next to Jack and Lassana Coulibaly, while up front, Kyle Lafferty and Daniel Candeias began supporting Jermain Defoe. There were Gers fans packed in all around Central Park, and it was they who, as ever, were making all the noise on what was an exceptionally cold evening with the temperature well below freezing. Wearing the captain’s armband was Andy Halliday, and it was he who opened the scoring after just 12 minutes. The tightly-packed Cowdenbeath defence had done well to that point to keep the Light Blues at bay, but after Halliday picked up the ball on the edge of the area, they were slow in getting out to the full-back and allowed him an extra touch to control the ball. That proved to be critical, with Halliday able to pock his spot and superbly blast the ball into the bottom-right corner beyond the reach of goalkeeper David McGurn. McGurn easily collected a Gareth McAuley header from a Halliday corner soon after but the second goal did arrive on 26 minutes. This time a Steven Davis corner was flicked on at the front post by McAuley and after Jermain Defoe couldn’t connect with the ball, it broke for Lassana Coulibaly to blast into the back of the net from inside the six-yard box. Gers continued to keep controlled possession of the ball before, in the one minute of added time, they grabbed a third, seemingly killer goal. Ryan Jack took the ball in advanced area and spotted a gap between the Cowden defence to play-in Kyle Lafferty. The big Ulsterman took the ball in his stride and slid it under the advancing McGurn and into the net. Right at the start of the second half, however, the home side were handed a lifeline, with the Blue Brazil awarded a penalty kick. Jon Flanagan looked to have won the ball from Kris Renton outside the area, but referee Craig Thomson adjudged otherwise and pointed to the spot. Wes Foderingham made a superb save from Harvey Swann’s kick, getting down low to his right, but the ball rebounded for David Cox to ram into the back of the net. The visitors almost restored their three-goal advantage straight away, with McGurn doing well to deny both Defoe and Candeias in quick succession from close-range, before doing likewise from the Portuguese again a few minutes later when he was put in by Flanagan. Cowdenbeath thought they had another back on 73 minutes when a scramble ended with sub Jordan Allan putting the ball in the back of the Rangers net only for the assistant referee’s flag to come to the rescue of Gerrard’s men. 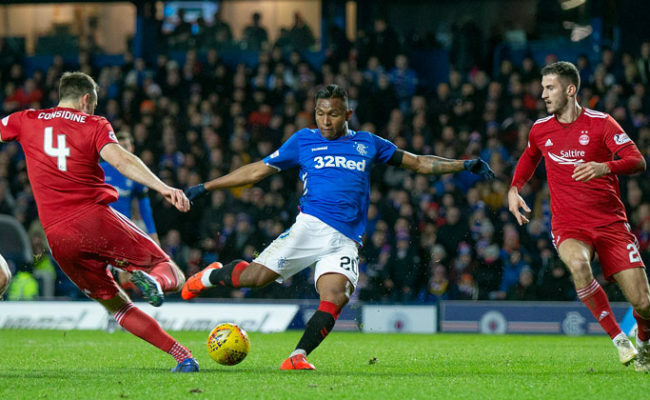 Both Davis and Ryan Jack had efforts from distance wide for Gers afterward before the manager handed a competitive debut to young full-back Jordan Houston late-on. RANGERS: Foderingham; Flanagan, McAuley, Katic, Halliday; Jack, Davis, Coulibaly (Middleton, 67); Candeias (Houston, 87) Defoe, Lafferty. SUBS NOT USED: McGregor, Worrall, Kent, Morelos, Arfield. COWDENBEATH: McGurn, Mullen, Talbot (Swann, 15), Pyper, Deas, Miller, Cox, Malcolm (Allan, 59), Renton (Henvey, 59), Fraser, Buchannan. SUBS NOT USED: Goodfellow, Sheerin, Scott, Sneddon.